Steve Campbell states in this Excerpt reprinted from The Commercial Appeal article dated December 20, 2007, “Most satisfying career moment: Now that it’s wintry outside, people begin thinking about mounting utility costs. I like the fact that I can offer suggestions to make homes and businesses more comfortable — as well as ways to save on utility bills and help our environment. An ounce of prevention from thermal digital imaging is now worth hundreds of dollars by saving thousands of kilowatts. The images pinpoint electrical overloads and leaks to detect potential breakdowns before they happen. For homeowners, the images provide visual aids to see the exact amount of heat and cold escaping through ceilings, walls, floors, ductwork and crawlspaces — literally illuminating the energy loss. It also is a powerful tool for detecting hidden moisture, which can lead to mold and mildew. And it has been immensely satisfying to bust some of the energy myths by educating clients about major cost-saving methods that require minimal out-of-pocket expenses.” To see the article in its entirety, click the link to Energy Watchdog: Steve Campbell Inspector; co-founder of Memphis Inspections Service, LLC. 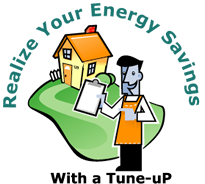 Conducting an Energy Audit can save you a significant amount of money over the long term. Memphis Inspections Service can find sources of energy loss with our thermal digital camera report unseen to the naked eye including the temperature differentiation around your windows, attic access and doors. SEE THE REAL ENERGY LOSS FOR YOURSELF! Make Your Building Eco-Friendly & Stop Throwing Away Money To the Utility Company Now! As energy prices increase at the current rate, a home or building that has been “Tuned-uP” will be more valuable at re-sale. GET GREEN TODAY! Your home or office is one of your largest investments. The best way to keep it running smoothly and efficiently is through regular maintenance. Below are some basic maintenance tips. If you were able to attend your inspection, you will have heard many of these already. This is not an inclusive list of all maintenance items. At your inspection, you should have received a FREE Home Repair Book by Tom Feiza “Mr. Fix-It” as seen on CNN regularly. If you have any questions concerning the operation or maintenance of your home, please call Memphis Inspections Service at (901)734-0555. We will be happy to help you in any way possible. We pride ourselves in providing Inspections With Exceptional Service! Windows — Remove screens and install storm windows. Be sure to caulk all window perimeters inside and outside. Ceiling fans — To save energy during colder weather, activate the reverse setting on your ceiling fans to circulate hot air that rises to the ceiling and blow it back down. Be sure to clean the ceiling fan blades to avoid perpetually blowing dust build-up. Leaves — Be sure to check restricted valleys on your roof and keep clean and clear of debris and leaves in these areas besides the gutters and downspouts. Rake and remove leaves left on the lawn to discourage disease. Hoses, outdoor faucets and sprinkler systems — Winterize your pipes. Be sure to have sprinkler systems serviced and drain all hoses and pipes before the season’s first freeze. Cover all exterior hose bibs and bring your hoses inside to prevent cracking. 1. Change all locks on exterior entrances for improved security. 2. Replace batteries in all smoke detectors. Put a note on your calendar to change them the same day as the time changes to make it easy to remember. 3. Create a fire escape plan for your new home. Consult your local fire department for advice on what to do in case of a fire. 4. Review your home inspection report for any items requiring immediate attention. 5. Learn the location of main shut-offs for your plumbing, electrical and heating systems. 1. Check your fire extinguishers to be sure they are fully charged. 2. Repair or replace leaking faucets or shower heads. 3. Check grout and caulk in bathrooms. Ensure water is not escaping during showering. Check below all plumbing fixtures for leakage. 4. Re-secure loose toilets and repair or replace faulty flush mechanisms. 5. Replace or clean heating and cooling air filters. 6. Clean all gutters and downspouts. Check that downspouts are secure. 7. Test all GFCI (ground fault circuit interrupter) devices. 1. Examine your roof for damage to the roof coverings, chimney and flashings. 2. Check around in the attic areas. Check for evidence of leakage, condensation or evidence of animal intrusion. 3. Check your landscaping around the buildings. Trim back tree branches and shrubs to be sure they are not contacting electrical/utility lines and the roof/shutters. 4. Inspect the exterior walls and foundation of the house for damage, cracking or movement. Look for bird nests, insect and critter activity. 5. Clean and test windows to be sure they are functional. Add caulking and weather-stripping if needed. Inspect for evidence of rotting wood. Paint and repair the window sills and frames as needed. 6. Test the garage door opener. Be sure the auto-reverse mechanism is responding properly. Clean and lubricate rollers, tracks, and hinges on the overhead doors. 7. Clean and inspect all appliances as suggested by the manufacturer. 1. Replace smoke detector batteries when the time changes semi-annually and be sure to test them regularly. 2. Have heating, cooling and water heater systems cleaned and serviced. 3. Have chimney inspected and cleaned. Be sure rain caps are the correct height and screens deterring animals are secure. 4. Call Memphis Inspections Service for an annual maintenance inspection. (901) 734-0555.